Saw this promotion by Ambank which offer renumeration for home sellers who recommends the home buyer to finance their residential property from Ambank. This is a strategy by Ambank to retain customers and also to attract new customers. Note that new buyers' or sellers', new property financing must be more than RM300K. However, 0.12% rebate is quite smallish (for a minimum RM300K loan, it is only Rm360 rebate). Look further in detail here. There is caveat on the early settlement waiver. However, I think this type of waiver is very common & easily negotiable, if a buyer finances the property using the same bank as the seller. i. 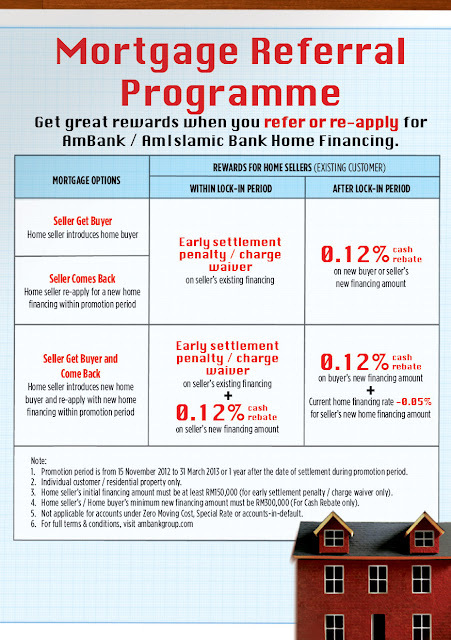 The early settlement penalty / charge waiver on Seller’s existing financing amount is subject to the new financing amount of the Buyer and AmBank’s discretion. current offered rate at the point of financing submission. iii. Validity period includes Programme Period and a year after i.e. 15 November 2012 – until 31 March 2014. Nevertheless, if the stars aligned together, at least you get some rebates under this campaign. Elly, it is likely to be impacted because banks will increase/decrease their interest rates due to the the BLR values. The website info needs to be updated if otherwise to reflect this.